Many well known melodic death bands like those from ‘In Flames’, ‘Dark Tranquillity’ and ‘At the Gates’ has spawned from the Gothenburg’s ever-growing metal scene, and influenced the rest of the world with their unique sound of “Gothenburg” metal style. One of those bands fighting to become a part of this movement is ‘ENGEL’ by adding some “twist & turns” by their own, to the already flooded melodeath scene. This is the third full-length creation with the title of ‘Blood of Saints’ from the five piece death squad. It’s a follow up to the debut release ‘Absolute Design” from 2007 and their iconic work from 2010 entitled ‘Threnody’. It’s a spinning “nightmare” of 11 tracks with a limited runtime of only 40 minutes. Packed with the same musical ingredients as from their previous releases, so those of you familiar with these guys will nod in recognition, when sounds of melodic, electronic, death, thrash and even progressive elements are bombarding your eardrums. The album is opening with a big bang, introducing us to the track ‘Question Your Place’, that is a mixture of ‘In Flames’ meets ‘Skrillex’. Its heavy use of dubstep influences, distorted aggressive guitar tones, hard hitting drum sounds and harsh screaming vocals is a perfect way to begin the show. You can’t compare it to the latest effort from KoRn, because it’s more brutal, heavy and angry and not overwhelmed by dubstep electronica tunes. Let’s then skip to track three ‘Feel Afraid’, with a great intro and it’s one of those tracks that got stuck on my mind during the first listening, with its slow crushing and catchy melodic guitar riffs. If you fell asleep during track three, the following track ‘Numb’ will wake you up again with its thunderous drums, fast heavy guitar riffs, hellish screams by front man Magnus and one breakdown with odd rhythms. Let us then jump to the track ‘One Good Thing’ that is unleashing brutal guitar riffs and melodies with perfectly fitted electronica tunes to the crowd. 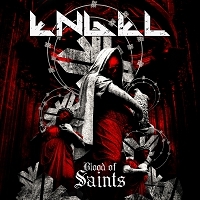 Last song on my hit list from this release is the title track ‘Blood of Saints’ with its groovy melodies, odd rhythms and industrial sound. I feel like eating a feast of melodic death metal elements, which is perfectly served by our “cook” Tue Madsen, who gives it a very thick and heavy sound. Why did this release not end up on the "Exceptional" list then? The feast has been poisoned by three things. First, the cheesy lyrics & chorus, just listen to the track ‘In Darkness’ with its chorus ”…Spread Your Wings And Ride The Rainbow…”. Second, the clean vocals by front man Magnus Klavborn. It destroys everything good on this release. Not saying he is a bad singer, because his harsh screaming vocals is stunning, almost resembling the one by Anders Fridén from ‘In Flames’. For their next musical creation, please concentrate on the screaming part that fits like a glove on this one. Third, too many filler tracks. Five good tracks out of eleven are not helping raising the score. Would I recommend this album to you? It all depends on your taste of death metal music. If you can handle the lyrics and the clean vox, then maybe this is something for you. Old fans will not be disappointed either, and should without any hesitation, add it to their melodic death metal collection.